Award-wining Egyptian photojournalist Mahmoud “Shawkan” Abu Zeid will be released from prison shortly after having been sentenced by a court on Saturday, his lawyer has told Ahram Online. 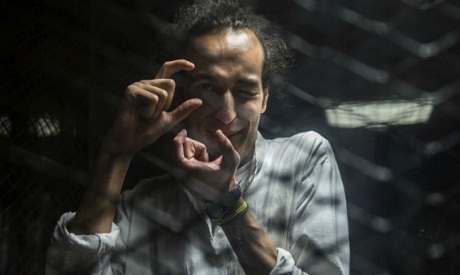 A Cairo criminal court sentenced Shawkan and 215 others tried in the same case, related to the dispersal of the Rabaa sit-in in 2013, to five years in prison. "Shawkan has already spent more than five years in prison since he was arrested on the day of the disperal of the 2013 Rabaa sit-in," lawyer Ahmed Abdel-Naby said. The freelance journalist was arrested in August 2013 while covering the dispersal of the Rabaa El-Adawiya sit-in in Cairo, where supporters of ex-president Mohamed Morsi had gathered to protest his ouster. He was charged with illegal assembly, being a member of illegal groups, and attacking state institutions. All 739 convicted in this case were facing similar charges includin premeditated murder, attacking citizens, resisting authorities, destroying public property and possessing firearms. "I will be working on the next couple of days on Shawkan's release procedures," said Abdel-Naby. Shawkan's lawyer said he would also be appealing the five-year sentence. Shawkan, 31, is the first Egyptian to win the UNESCO/Guillermo Cano Press Freedom Prize, having been selected by an independent jury of international media professionals. The court on Saturday also sentenced 75 members of the outlawed Muslim Brotherhood group to death, including leading members Essam El-Erian and Wagy Ghoneim, among others. It also sentenced the group's spiritual leader, Mohamed Badie, as well as 67 others, to life in prison. All convicted on Saturday have the right to appeal the court verdict within 60 days.